Read the whole review below or jump to any section using the main headings below and the sidebar on the left. Or download the review, or a shortened version, as a pdf. The role of the private sector in corruption is ambiguous and at times contradictory. As one anti-corruption expert puts it: ‘The private sector cannot be generally treated either as a victim of corruption or as a perpetrator. It can be one or the other or both, depending on sectors and countries. The private sector is often a victim of some types of corruption and is often vocal against it, and at other times it is primarily a beneficiary, and drives corruption through links with bureaucrats and politicians’. We believe that private sector companies are crucial to reducing corruption. Most of the problems require the active engagement of multiple stakeholders, including both government and private sector. Note that we are not providing guidance on Company compliance and ethics programmes. This website is aimed differently, at how governments can lead on corruption reform and how the private sector can assist. There is a huge amount of guidance available on-line on how companies should organise themselves to avoid corruption in their businesses by setting up compliance, ethics and integrity programmes. The originating author of this review is Tom Shipley, who is one of the editors of CurbingCorruption and is currently a PhD candidate at the Sussex Centre for the Study of Corruption. Additional contributions were made by Mark Pyman and John Bray. Look at the template of the different sector corruption types in our review. Use this as the basis of your identification of the corruption types in your situation. Gather available data. We suggest that you do this first at a macro level, to get a sense of which corruption issues are big or small across the sector, regions and/or countries. Often there is a lot of such macro data publicly available. Then, gather available data at the micro level, local to you. Decide if it would help to do a formal analysis of the corruption types and the levels of corruption risk. This takes time but gives you a thorough baseline for your reforms. It also serves to show the level of danger and damage from corruption to staff and to the public. Consider doing an analysis of the levels of support and opposition that you can expect. This is called a ‘political economy analysis’. Prepare for the later step in which you develop your strategy (Step 4) by thinking about which the best ‘entry points’ are likely to be – certain corruption types, regardless of scale, merit being tackled first because they are the most likely to build momentum and/or enable further reform. This choice of starting point is hugely context dependent. You can read more guidance on Step 1 here. Common means by which bribes are paid by businesses include Agents, Intermediaries, Introducers; Associates – Sub-contractors and Distributors; Off-shore arrangements and off-balance sheet payments; Joint ventures; Training; Per diems and expenses; Rebates and discounts or kickbacks; and Employment contracts and association agreements. There are also a range of corruption mechanisms that may or may not also involve bribery. These include insider trading, collusion and cartels, and policy capture. 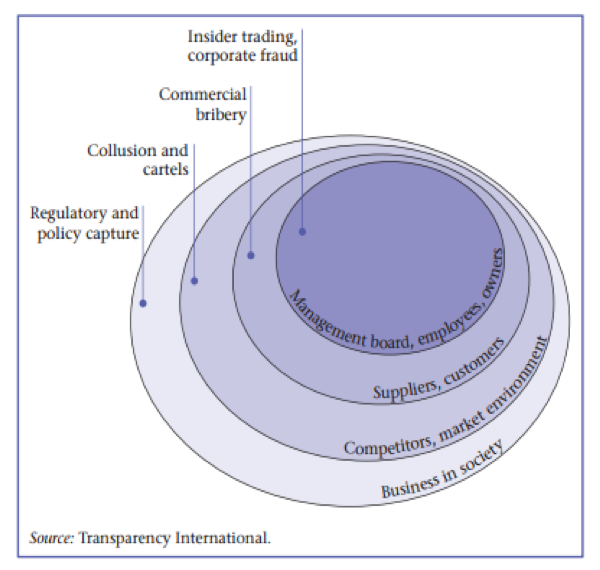 Transparency International’s (2009) report on ‘Corruption and the Private sector’ typifies them in the diagram shown on the right. The first two are based on perceptions, the third is based on experience. A good additional approach is to develop your own country-specific data. 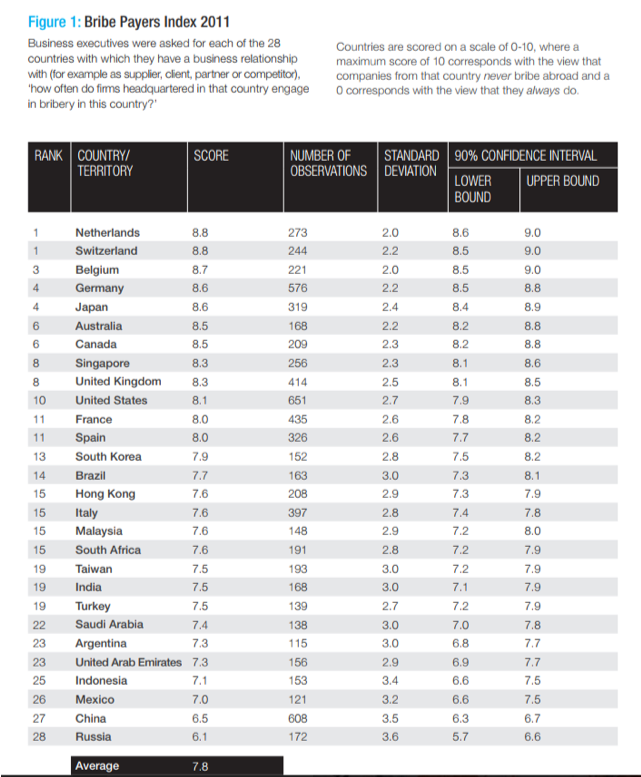 NOTE: This is a different index from the TI Corruption Perceptions Index! First completed in 1999, Transparency International’s Bribe Payer’s Index represents an attempt to better capture the international ‘supply side’ of corruption from the private sector than traditional perception indices. The index ranks the world’s wealthiest countries by the propensity of their firms to pay bribes to win business overseas. The most recent index dates from 2011 and covers 28 countries. It is based on surveys of around 3,000 business people at large firms. The findings are also broken down by business sector. The diagram below summarises the outcome of the 2011 survey. 1.2.2 European Union businesses’ attitudes to corruption in the EU. The European Union’s Flash Eurobarometer 428: Businesses’ Attitudes Towards Corruption in the EU is an example of regional survey which again offers an opportunity for national comparison. As described on the EU Open Data Portal, ‘the survey looks at businesses’ experiences and perceptions of corruption in the EU. Themes covered include: the main problems companies encounter when doing business; the prevalence of a range of corrupt practices; the management of public tender and public procurement procedures; the prevalence of illegal practices and corruption in public tender and public procurement procedures; experiences of bribery in encounters with a range of public services; and opinions about how corruption is managed and punished. Results are aggregated at EU level and broken down by Member State and are also separated by business sector’. It is also possible to generate a custom data set differentiated according to business sector or firm size. The World Economic Forum has a wealth of information that is relevant to tackling corruption in the private sector. Their Global Competitiveness Report (2018) is the core data source. The structure of this excellent index is shown below. Within the structure of their index, many elements are relevant to corruption and integrity, but especially Pillar 1 (Institutions) and Pillar 6 (Market efficiency), especially the time required to start a business (Indicator 6.07). What is also noticeable and important from these tables is the way that other indicators that also are impacted indirectly by corruption matter: examples include tax regulation, inefficient government bureaucracy and poor work ethic. There are likely to be good groups in your country who can do a diagnosis of corruption vulnerabilities in your Ministry: commission one of them. Or, your own staff are usually well aware of the corruption issues. You can ask a group of them to develop the spectrum of the problems and their relative importance. They can use some of the guidance available in this website. Example: Colombia. In 1999, Colombia’s leading business association Confecámaras launched a private sector integrity initiativecalled “Probidad” to combat corruption in Colombia. The initiative began with a detailed business survey to gauge perceptions of public sector corruption, confirming that bribery and lack of transparency were seen as major problems and that many companies did not participate in public procurements because of corruption concerns. These findings sparked a broader public debate in Colombia on the role of the private sector in corruption and contributed to government anti-corruption reforms, including a new procurement law in 2007 that strengthened and harmonized practices across the country. The survey also supported other Probidad initiatives, including municipal integrity pacts and a code of conduct for local businesses. Alternatively, in such circumstances, countries can get a lot more information by using more detailed interviewing in particular sectors. The advantage of this approach is the depth of response and the ability to analyse corruption in specific sectors. For example, there has been such interviewing on the energy sector in Bangladesh, which shows how expert feedback from interviews can be developed into analysis of anti-corruption measures (See Khan, 2014). The author, Professor Mushtaq Khan, writes that they achieved significant insights with a high level of confidence from 18 interviews, which ‘ required access to respondents who would not only have a high level of practical knowledge but also and more importantly, the confidence in our research team to talk as candidly as possible about sensitive processes in which they are very likely to be involved themselves. Respondents in business and government were approached through highly placed businessmen previously known through prior work in Bangladesh’. Example: Egypt. This is not directly an example of business reform; but it is nonetheless a good example because it shows the private sector community in a difficult country developing an evidence base of corrupt practices. It is a national survey undertaken by the Centre for International Private Enterprise of the experience of small and medium sized enterprises (SMEs) in their report ‘Business Environment for SMEs in Egypt and SMEs’ Interaction with Government Agencies: 2009 Survey on Corruption’. The survey gathered information from 800 Egyptian SMEs and focusses on experiences of corruption in specific business processes, such as interaction with government agencies in establishing a business. Data is also broken down for different sizes of business (based on number of employees) and sectors. There is a guidance note published by the UK Department for International Development (DFID) in 2015, entitled ‘Analysing the Impact of Corruption on Private Sector Development: Country Case Studies and Analytical Tool’, which outlines a methodological framework. The DFID report discusses the approach using case studies in Bangladesh, Nepal and Sierra Leone. Khan (2014) suggests a useful analytical framework for considering what forms of development assistance will be the most useful. Khan argues that the intervention should ‘identify a number of critical areas of corruption affecting business where corruption has the dual characteristic of having a big impact on private sector performance (defined as the growth of output, investment or employment) and being relatively amenable to policy responses that seek to mitigate some of these negative effects’. He starts by defining four categories of corruption issues, each with differing effects on the private sector: Market-restricting corruption, State-constraining corruption, Political corruption and Predatory corruption. Each in turn has different levels of susceptibility to reform. The four are shown in the diagram opposite, arranged by the feasibility of anti-corruption strategies against the impact of the corruption. Problem: Some corruption is associated with business attempts to by-pass market-restricting government regulations that are unnecessary and do not serve any compelling public purpose. Here the underlying problem is the presence of market-restricting regulations that have damaging effects like preventing firms from entering markets or expanding their scale of production. All regulations inevitably restrict the freedom of businesses, but the characteristic of market-restricting regulations is that they serve no economic or social purpose. Examples of such restrictions are red tape and delays in getting permissions, or unnecessary requirements of getting multiple permissions from different agencies and unnecessary entry and exit regulations. The presence of such market-restricting regulations can induce corruption as businesses may be willing to pay to evade or by-pass these restrictions. Response: The appropriate policy response is to roll back the damaging restrictions. Conventional anti-corruption strategies like improving transparency and simplifying and improving regulatory procedures in critical areas can have a moderate economic impact on business by mitigating market-restricting corruption. Problem: This type of corruption is associated with situations where the state lacks the capacity to perform necessary functions. The underlying state capacity failures can range from the failure to provide public goods like the protection of property rights, the failure to provide services such as infrastructure or power, or the failure to address market failures constraining the private sector, for instance affecting skills development, investment, and so on. The impact of state-constraining corruption can therefore vary quite a lot. In some cases, the state lacks the capacity to enforce necessary policies, and here corruption can be associated with policy distortion. In other cases, the state may even lack the capacity to provide the necessary policy or service, and here corruption may be associated with second-best solutions to the deeper problem. An example of the latter would be a situation where a state lacks the capacity to protect property rights and the private sector makes informal (corrupt) payments to the police or to politicians to purchase the protection of their right. Response: The impact of removing state-constraining corruption can therefore sometimes be very positive (if the corruption was preventing a necessary policy being implemented) but sometimes it can make things worse in the short run if the private sector was using corruption to access ‘services’ that the formal state was unable to provide. Anticorruption strategies here have to improve bureaucratic competence and enforcement capacities and may face opposition from powerful organisations whose access to significant rents may be affected. In some cases, if anti-corruption strategies aim to remove this type of corruption without ensuring that the private sector gets the public goods and services it needs in some other way, the strategy may have little political traction as it may be difficult to find private sector stakeholders who will seriously push for a reduction in these types of corruption. Some types of state-constraining corruption are therefore likely to have both a high impact on the private sector and the anti-corruption strategies may be moderately feasible, but some types of state-constraining corruption may be less feasible to attack. Problem: ‘Political corruption refers to personalised and often illegal political allocation of resources that often sustains the political settlement in developing countries… Attacking political corruption with the policy tools available to development partners is not likely to yield any results. The structure of rents and therefore of corruption that sustains the political settlement is different across countries and can change over time as the configuration of powerful organisations changes. These changes can have significant implications for economic performance (Khan 2010). Response: Addressing political corruption requires changing the political settlement. Unfortunately, political settlements change slowly and in response to social mobilisations and political movements, and it is usually not feasible to change them using the policy instruments that we are discussing’. Problem: Predatory corruption involves extortion, and this often has the most damaging impact on the private sector. Extortion happens when the private sector has to give up resources under threat of violence or serious damage. Powerful organisations engage in predatory corruption when they have very short time horizon. Predatory corruption can take a variety of forms including extortionate ‘donations’ collected from businesses by political parties and local mafias, tolls and security payments collected by local strongmen to allow travel or do business across regions, theft of public property (like natural resources, land or tax revenues) by coalitions of local or regional politicians, bureaucrats and private businesses, and so on. Response: Predatory corruption can potentially have very negative impacts on the private sector, but here the usual policy instruments for fighting corruption are even less likely to work. Tackling predatory corruption involves state-building and party-building strategies, including improving the competence and capacities of enforcement agencies but also political strategies to create a more cohesive, legitimate and effective ruling coalition’. Talking through with colleagues and stakeholders how each of them might work in your environment enables you to ‘circle around’ the problem, looking at different ways and combinations to tackle it. A reform strategy might, for example, consist of some institutional improvement projects, plus strengthening integrity among staff, plus strengthened sanctions and discipline. You can read more guidance on Step 2 here. The first modern-day collaborative endeavour was started in 1997 by a few large international oil and mining companies, working together with governments and civil society, to improve transparency in the oil, gas and mining sector. This became known as the ‘Extractive Industries Transparency Initiative’, or EITI, and is now a large established initiative, headquartered in Oslo, with some 50 governments participating. Private sector companies are well aware that a company acting non-corruptly on its own is unlikely to thrive. The situation improves markedly when a group of companies, or the whole industry sector, takes up a commitment to higher standards. This is known as ‘collective action’, to solve a problem that is almost certain to elude individual action. Such collaborations involve private sector companies working together, or private sector plus government, or private sector plus government plus other involved stakeholders (often local communities). Collaborations almost always start small. Here are some ideas as to how you can progress. These are followed by ideas on how to pressurise companies. Set up a government-industry forum on corruption reduction. Encourage the leading businesses in the country to set up such collaborative forums directly. Bring together their CEOs to explain to them why this matters and what you want from them. Make engagement in such forums a regular practice in each Ministry. They should set up routine meetings with the industries in that sector, and with the relevant national industry associations:” e.g. with the pharmaceuticals industry association, the construction industry s, the defence industry association, etc. Engage with the international and multi-country initiatives what bring countries and companies together. Many such sector initiatives are described elsewhere in this website: See below. Routinely require companies to demonstrate that they have an ethics and compliance programme. Require it when they tender for government business, for example. Require each government department to review what requirements they place on business in relation to corruption and bribery. the Pact for integrity and transparency in business in Romania (established 2011). Such agreements can include all private sector companies, or be based within an industry sector, or be relevant for the professionals in that sector. In general, the narrower the group, the more chance of it having an impact. Such agreements are often accompanied by various types of joint activities, for example to raise awareness about ethics principles, or to engage other partners in training activities on business ethics, or to address a particular industry corruption problem. These joint activities are often an important means of increasing trust among partners to a declaration. ‘Market players are involved in the design of the standards on anti-corruption, and then voluntarily submit to these standards. Adherence to these standards is a condition of continued membership of the initiative. Failure to comply with the code of conduct could result in a participant being expelled from the initiative. The Basel Institute of Governance has a list of standard-setting initiatives that it knows about, 52 as at June 2018, which you can look through. Example: Paraguay. Sometimes these initiatives can have specific and modest objectives, for example as part of a broader effort to combat corruption, Paraguay has streamlined its customs office and created a one-stop-shop mechanism for the import and export of goods. Companies with a proven record of integrity have benefited from expedited processing. One method of eligibility has been through a training and certification system developed by Pacto Ético Comercial, a private sector collective action initiative. This example is from the United Nations Convention against Corruption (2013), A Resource Guide on State Measures for Strengthening Corporate Integrity. The most prospective form of collaborative agreement is when all the parties are coming together to solve a specific corruption problem. We give two good examples below: the effort of shipping companies not to have to pay bribes in Nigerian ports, which has developed as the “Marine Anti-Corruption Network, and a supply chain initiative through which western companies can non-corruptly buy rare earth metals from African mines. There are several schemes in DRC where the mining companies agree to operate a pan-industry tracking system, so that the provenance of the minerals can be assured. The main system is operated by the tin mining organisation ITRI. ITRI has developed the ITSCI program with the objective to trace minerals from their origin to the end user. The objective is continued access to the world markets for the 3T minerals from the Great lakes Region. The CTC (Certified Trading Chain) system for the 3TG minerals (Tin, Tungsten, Tantalum, Gold) is implemented by BGR in the DRC since 2009. The CTC model aims to provide assurance for smelters and downstream supply chain partners while also building the capacities of artisanal miners towards responsible mining practice including safety, social and ecological aspects. The CTC standards are closely harmonized with the RINR of the ICGLR. The ‘ITRI Initiative’ does not need big mining firms. It is focused on small mining forms, e.g. with the 3TGs and artisanal firms. It relies on the agreement in the Dodd Frank Act that US companies will not purchase from questionable sources. Major buyers such as Motorola, Apple and GE are very involved. US firms purchasing these minerals are very focused on complying with Dodd Frank, as they are concerned about their liability. The mining companies finance the scheme, but they don’t run it, because that would be a conflict of interest. ITRI runs the scheme with an NGO called PACT, covering in excess of 250 mining sites in DRC, for example. They have a good system for alerting companies when there is some irregularity or false certification. You have to abide by the ITRI rules to be a member of the club. If you don’t join this club you can still sell the minerals, but you are heavily limited in who you can sell them to. Here a private sector initiative has created something powerful. There are parallels with the Kimberley process, which was partly successful (a reason for the partial failure is that it was mostly managed by government), and similarities also to certification of animal parts sales and MACN. Another example – Nigeria, shipping and MACN. The Maritime Anti-Corruption Network (MACN), consisting of shipping and freight-forwarding companies, and some key ship investors, has grown over five years from around 20 members to over 70. The MACN launched its first Collective Action project in Nigeria in partnership with the UN Development Program (UNDP) in 2012. It combats corruption in major Nigerian ports, where vessels have often been met with demands for facilitation payments by port officials. Nigeria’s government and the companies involved both acknowledged the problem and their commitment to resolve it. Relevant government agencies are now collaborating with the MACN to generate training, standard operating procedures covering the actions of vessel officers and port officials during port calls, a formal complaints process, and enhanced cooperation between various agencies. The UNDP has contributed funds and other resources to the project, which has also received support from the UK government, for example. The key aim of the MACN project is to achieve effective collaboration between government agencies and companies to eliminate corruption by employing simple practical tools and processes. Integrity Pacts are the most demanding from of collaborative agreement because they involve some form of external enforcement, usually done by civil society. It is a tool originally developed by Transparency International in the early 1990s to help lower corruption risks in public procurement. An Integrity Pact is a contractual agreement between a government agency managing a procurement process and the companies bidding on the project to refrain from bribery and other forms of corrupt practice. It is in use to date in 18 countries at different levels of government and across different sectors. A core component of the Integrity Pact model is the nomination of an independent external monitor, a role which has often been fulfilled by civil society groups. Civil society can also advocate for the adoption of Integrity Pacts and highlight abuses in the contract processes. For more detail, see Transparency International, Understanding Integrity Pacts, April 2016, and Integrity Pacts: A How-To Guide from Practitioners, May 2016. The second publication includes several examples of practitioners’ experiences in implementing in Bulgaria, Germany, Hungary, India, Latvia, Mexico, Rwanda and Thailand. 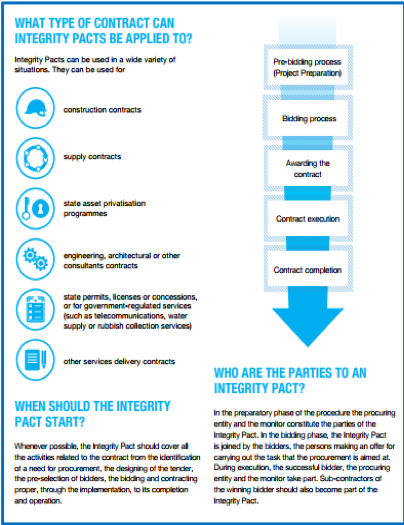 The same publication covers key points such as how to select a suitable project for an Integrity Pact, guidance on preparing and implementing an Integrity Pact, and finally how to evaluate the project. These days there are also business publications that describe how integrity pacts work from the point of view of business. See, for example, the Center for International Private Enterprise’s publication Approaches to Collective Action: how businesses can lead the fight against corruption (2013). The Basel Institute records fifteen cases of integrity pacts in its database; but the number of actual pacts is orders of magnitude greater than this, as some countries have extensive experience of using such pacts. Example: Germany. The following two publications from Transparency International include full case studies of the Berlin Airport Project, one of the most prominent examples of the implementation of an Integrity Pact. The first publication provides a detailed description of the process of establishing the pact and its component parts. In 2015 Transparency International took the decision to withdraw from the pact as it held the view that the airport authority was not taking corruption risks sufficiently seriously. The second publication provides the background on that decision and is equally valuable in understanding ‘lessons learned’ from the process. Companies will adapt their working practices to the laws and reality of their marketplace. Sometimes this mix of regulation and practices drives companies away from honest behaviour and towards cutting corners or corruption. This might be because they are slow and cumbersome – the time taken to formally start a business is one graphic example of this – or it might be because a lack of transparency in the market favours certain players, or it might be because some rules actively encourage bribery. The classic example of this is highly complex business sectors that require multiple approval steps and/or multiple certificates to operate. Construction, oil/mining and defence are three such sectors, and the effect has often been actively to favour corrupt companies. As with investigations, the starting point here is to know your national marketplace. Usually each industry sector is different, so this is best done at sector level, ministry by ministry. There is a useful publication from a US organisation, the Center for International Private Enterprise(CIPE), called ‘Combating corruption: a private sector approach’ whose purpose is to mobilise the private sector to raise anti-corruption standards and advocate for reforms. It examines root causes of private sector corruption such as ‘complex and contradictory laws and regulations, discretionary power of public officials, lack of transparency in public procurement, inconsistent enforcement, and absence of competitive markets’. This publication describes a series of measures to reduce what it terms demand-side corruption from the public sector affecting businesses. Examples of country reform programmes are provided to support the recommendations. Streamline laws and regulations. Eliminate or reconcile duplicative and conflicting commercial laws in order to reduce barriers to doing business along with incentives to pay bribes. One method is to grant independent commissions of judges the authority to reconcile or strike down inconsistencies. Business associations and think tanks, too, can create inventories of legal barriers and duplicative regulations that need to be changed on a priority basis. Integrate the informal sector into the mainstream economy. Large informal economies emerge when conflicting laws and regulations make compliance impossible, particularly for small firms. Informal firms can be brought into the mainstream by lowering the barriers to starting and operating a formal business, for instance, by streamlining business registration procedures. Another approach is to exempt small firms from certain regulatory requirements. Introduce civil service reforms. A living wage for civil servants that is competitive with private sector salaries reduces the demand for extra payments. At the same time, professional standards, training, and performance monitoring should be implemented. The authority of inspectors should be carefully defined so inspectors do not overstep their bounds. Promote clear rules on conflict of interest for the public sector. In many countries, it is still possible for government officials to hold additional paying positions in private or state firms, or to accept consulting fees from private firms. At a minimum, such relationships should be disclosed, and the officials barred from making decisions affecting those firms. In addition, officials should be restricted from moving into positions in firms doing business with the ministries or agencies with which the officials serve. 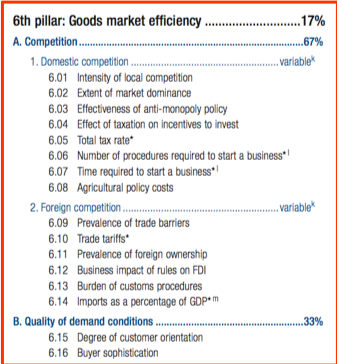 Much of the relevant indicators of these problems are found in the World Economic Forum Competitiveness Review, quoted in Section 2 above. The National Association of Entrepreneurs (ANDE) initiated reform in 2000 to change the direction of business and institute “clean” practices. The ANDE studies showed that there are over 92,250 legal norms with overlapping, unclear, and contradictory laws, which are left to the discretion of government officials for implementation. Because Ecuador is legally a civil code country, the courts have not been able to reconcile the law or create precedents. ANDE recommended creating a seven-member judicial commission empowered to codify and reconcile law and to draft and executive decree to eliminate overlapping and duplicative regulations from the records. The Commission for Legislation and Codification has since been appointed in the National Congress and works to ensure that future laws are consistent with the Constitution. Despite the political turmoil that plagues relations between the private sector and government in Ecuador, ANDE has been able to eliminate 1,310 outdated or conflicting laws regarding commercial transactions. More important was the clear enunciation of the guiding principles underlying the legal simplification effort, including the importance of creating and maintaining juridical security; the primacy of the Constitution as the basis for the validity of subsequent rules, norms, and decrees; consistency across executive branch agencies in their rule-making; and better transparency and accountability for the decisions reached by public sector officials. ANDE continues to work with the Chamber of Commerce of Quito to pressure the government to adopt legislation that would eliminate still more conflicting laws now on the books. For more information, see CIPE Combating Corruption: A Private Sector Approach (2011). In 2006, the Association for Foreign Investment and Cooperation (AFIC) partnered with the Center for International Private Enterprise (CIPE) to advocate for public and private sector cooperation on tax reform. AFIC initiated the adoption of a new unified Tax Code and successfully advocated for reforms to eliminate opportunities for corruption. The initial advocacy efforts and analysis were based on an anonymous survey of 205 entrepreneurs and business associations. Through targeted legislative amendments, the project had a remarkable impact on the creation of a new tax system to combat corruption. In August 2008, Armenia’s National Assembly adopted a legislative reform package that included recommendations from AFIC; among these was an amendment to the Law on Simplified Tax. Under the previous simplified tax law, large businesses were able to misrepresent their annual revenues in order to qualify for lower taxes. AFIC’s recommended revisions to this law restricted the ability of large businesses to manipulate the tax system, and simultaneously promoted the growth of small and medium enterprises that need and benefit from tax breaks. Other amendments approved by the National Assembly allowed businesses to mail in their tax information, and another created a modernized, computer-based system through which tax documents can be filed and processed. Together, these aimed to shrink the opportunity for bribe-seeking by diminishing the need for face-to-face interaction between businesses and tax authorities. A subsequent AFIC survey of business people found that the tax reforms had lowered tax-related business costs by 12 to 15 percent and were perceived to have reduced costs by lowering demands for facilitation payments. For more information, see CIPE Combating Corruption: A Private Sector Approach (2011). Khan (2014) has applied his framework theory on the diversity of rents (cross-reference) in research in three areas in Bangladesh: the garments industry, electronics and machine parts microenterprises and land transactions. On the basis of an analysis on the forms and drivers of corruption in these areas, he makes recommendations on feasible reform strategies to align with the interests of private sector actors. To take an example, he identifies one of the underlying drivers of corruption in the garments industry to be the complexity of regulations and weaknesses in state enforcement capacity. This obliges companies to bypass regulations to continue running their business even where that business might wish to be compliant. A proposed reform strategy is therefore to reduce regulatory requirements to a ‘core of absolutely essential minimum requirements that have to be enforced for all businesses, and that can be enforced with feasible improvements in competencies and capacity’. His paper provides further examples which illustrate how a detailed understanding of drivers of private sector corruption in a specific context can be used to inform recommendations. Many companies are currently actively involved in multi-national transparency efforts via the G20, the B20, the OECD, and other international groupings. By supporting such international engagement, you are assisting companies in your country to be active members of the global anti-corruption efforts of the private sector. At the 2016 UK anti-corruption summit, for example, the following trans-national initiatives involved transparency and companies in one form or another (Pyman et al 2018). Systems are essential for tackling corruption. Very often though this is not the case: the official systems are often old, cumbersome and unsuited to any such intelligent query. Companies can be oddly reluctant to make their own sophisticated systems give up the data that you think should be public. But, like with the big examples, this is a very powerful tool. Here is one example from the shipping sector. The Danish company Maersk developed their own efforts in stopping facilitation payments in ports, starting with an effective system for logging all small facilitation payments by all their Captains. The trend of the number of these payments worldwide from Jan 2015 to May 2017 – shown in the Maersk data here – shows the success of their initiative (Feb 2018, published with permission of Maersk). The High-Level Reporting Mechanism (HLRM) concept was originally developed by OECD, the Basel Institute on Governance and Transparency International. They worked together with a group of international companies to develop an alternative to cumbersome and slow judicial processes, one that would provide an early recourse for companies. The mechanism is an in-country process for receiving, assessing, and quickly resolving complaints from companies confronted with bribery solicitation or other similar concerns in specific administrative processes or public projects. The HLRM is not a legal mechanism and it functions alongside law enforcement institutions. The HLRM offers companies an alternative to legal or administrative systems or public accountability mechanisms, or national and international mediation/arbitration. HLRMs differ from these forms of dispute resolution in that they offer a simplified, faster way to settle issues, while still recognizing the right of companies to take their grievances to courts or other mechanisms, as HLRMs do not provide legal remedies. A mechanism that fits into the broader anti-corruption system. HLRMs are intended to be complementary to other anti-corruption efforts. The HLRM must have clear, transparent and sufficiently independent governance structures to ensure that no party to the complaint can interfere with the fair conduct of the resolution process. As a prerequisite for this, the HLRM should offer a reporting channel that is above and independent of the agencies whose employees are alleged to be soliciting bribes. A mechanism that prevents retaliation. A HLRM will only work when companies are encouraged to share their concerns freely, without fear of retribution. A Mechanism based on dialogue. One of the strengths of a HLRM is its power to use informal means for quick problem solving. It may also help prevent a conflict from escalating. A dedicated and thorough follow-up. The HLRM is dedicated to follow-up to any pertinent matter that is reported. Two countries are already using customised models of the HLRM. In Colombia, the HLRM is located in the Office of the Presidency, reporting directly to the President. In Ukraine, the HLRM is in the Office of the Business Ombudsman, operating as an advisory body to the Council of Ministers. In April 2013 Colombia formally launched a High-Level Reporting Mechanism (HLRM) for Businesses in an initiative coordinated by the Secretariat of the President for Transparency – an office in charge of policy design and coordination in the anti-corruption field and reporting directly to President. The purpose of establishing the mechanism was to ‘the mechanism was called upon “to provide anyone having a concern over potential bias in the design or conduct of a procurement procedure the ability to notify the Transparency Secretariat for the purpose of prompt resolution of matters concerning alleged irregularities’. Colombia is the first country that has worked out the details of the requirements for filing of complaints and formalized procedures for reviewing these complaints in the context of a High-Level Reporting Mechanism. The HLRM was initially applied in the tender process for the 4G Roads Project (2013 – 2014). Colombia has chosen a structure based on a technocratic expert composition. HLRM executive functions are carried out by the Secretary for Transparency, which include receiving and processing applications, cooperation with other state agencies, and coordination of all HLRM activities, the key role among which is played by an ad hoc committee, consisting of four experts in the field of criminal and administrative law, civil engineering, and procurement, and whose task involves review of concrete issues and cases in relation to the 4G Roads procurement process. For the 4G Road Pilot, out of a total of 15 pre-selected companies for the nine projects, the Office of the Secretary for Transparency received complaints from two of them, one in relation to the 190km Girardot-Puerto Salgar project (part of the highway system connecting the capital, Bogotá, with the north coastal region) and one concerning the 90km Loboguerrero-Mulaló project. This was in effect a limited use of the tool. The report notes that the location of the HLRM in the Presidency gave it legitimacy, but this might also have created scepticism and raised concerns among companies. Access to the HLRM was also restricted to the bidding parties. Nevertheless, the report notes that ‘Anecdotal evidence from foreign companies operating in Colombia suggests that the HLRM has boosted trust and confidence in the economy’ (Basel Institute on Governance (2015), Working Paper No 19: High Level Reporting Mechanisms in Colombia and Ukraine p.22). You can encourage industry to show publicly that it values non-corrupt behaviour and rewards its own members for high integrity behaviour. Many such examples exist now. Example: Morocco. Since 2006 the Conféderation Géneral des Entreprises de Maroc (CGEM) has awarded a CSR label (Label CGEM pour la Responsabilité Sociale de l’Entreprise – RSE) to companies that comply with nine key CSR and sustainability principles, including prevention of corruption, respect for the rules of fair competition, and reinforcing transparency in corporate governance. Companies committing to these principles and passing an audit process receive the label, and subsequently qualify for a variety of material benefits from different organizations, e.g. customs and import administration, National Social Security, Groupe Banques Populaires and others. Benefits include preferential rates and charges, simplification of procedures, and faster processing. Humboldt-Viadrina School of Governance, Motivating Business to Counter Corruption: A Practitioner Handbook on Anti-Corruption Incentives and Sanctions (2013). 2.11 Do these collaborative measures work? Government officials often regard companies and the private sector as the ‘villains’ when it comes to corruption. The stereotype that company executives will seek to find any way to do the business, naturally including bribery, is one that is deeply ingrained in the culture of many societies. This is still very often true, as the recent massive corporate corruption scandals in Brazil – the so-called Odebrecht scandal – all too clearly demonstrates. The need for control measures over companies is still as strong as ever. Nonetheless, the reality is more complex and more hopeful. In the last twenty years, the larger international companies have moved towards a position of supporting strong anti-bribery measures, at least officially, because the penalties for being caught have dramatically increased. For example, business across Eastern Europe has long been widely dominated by bribery, but surveys in the last five years shows that this is changing as companies are more careful of the plethora of national laws more actively criminalising bribery. effective enforcement mechanisms for reputation protection. You will need to form your own assessment in your environment. What is the case is that major changes in direction often happen via a multitude of much smaller steps, each of them modest. So, if in doubt, we encourage you to initiate work with the private sector. The above sections review ways in which companies can act together against corruption, and other ways in which governments and companies can work collaboratively together. Sometimes, though, the atmosphere is not supportive of collaboration, and what is needed is for pressure to be exerted on the companies. Should you apply incentives or sanctions or both? The answer is usually that you need to do both. The German University Humboldt-Viadrina (2013) did a survey in 2012 of 223 international anti-corruption experts to rank the incentives and sanctions in terms of their likely impact based on the views of those surveyed. Most – 74% of those surveyed – felt that incentives and sanctions were equally important. There was variation by region: North American respondents rated sanctions as considerably more important than the average than incentives. Respondents from Latin America, Asia the Middle east and Africa rated sanctions as less important than incentives. There are several ways in which you might apply both sanctions and incentives. In developed countries, it has become commonplace for medium and large companies to have some sort of compliance programme. A compliance programme is a set of activities in the company that, taken together, ensure that the country is looking out for corruption risk, and is prepared to act to ensure that it does not take on that risk. Mandatory: Some or all companies subject to the laws of the country are legally required to have a corporate compliance programme. Leniency considerations: The incentives offered are weaker than in countries offering an absolute defence to criminal liability. Courts are directed to consider the existence of a compliance programme when determining liability and assessing the penalty for the acts. Argentina 2017 Corporations with compliance program that meets standards not liable for corrupt acts of employees. Brazil 2013 Clean Companies Act provides reduced penalties for bribery if company has strong compliance program. Canada/Quebec 2012 Public Contracts Act requires any enterprise public or private entering into public contract worth $C 5 million or more to secure integrity certification from Autorité des MarchésFinanciers. Chile 2009 Corporate Criminal Liability Act provide company with compliance program not liable for employee’s bribery. Colombia 2016 Law 1778 of 2016 requires corporations to have ethics and anti-bribery program. France 2017 Companies (i) with over 500 employees or (ii) that are part of a group, the parent of which has its registered office in France, whose workforce totals at least 500 employees and with annual gross revenue which exceeds €100 million must implement compliance program. Germany 2010 Munich court ruled in 2010 management liable for failure to implement compliance program based on effective prevention and risk control. Italy 2001 Legislative Decree no. 231 provides a corporation may be held liable for corruption crimes but suggests that if a compliance program was in place prior to the offense and was “well-tailored” to the risk areas where the act was committed, the courts can excuse a corporation from responsibility. Malaysia 2017 Corporation signing the Corruption Free-Pledge will not be held responsible for acts of corruption committed by individual employees. Mexico 2017 Ley General de Responsabilidades Administrativas provides that the existence and enforcement of an integrity policy will be considered a mitigating factor when assessing liability of a corporation whose employee paid a bribe. Transnacional provides that a corporation is not liable for an employee bribing a foreign public official if it had an appropriate prevention program consisting of surveillance measures and appropriate control to prevent crime or to significantly reduce the risk of commission. Russia 2013 The Obligation of Organizations to Undertake Anti-Corruption Measures law requires organizations to have anticorruption measures in place and offers six suggestions for what they might contain. South Africa 2012 Companies Act Regulation 43 requires a company to have an anticorruption compliance program and its social and ethics committee to monitoring its effectiveness. South Korea 2016 Foreign Bribery Prevention in International Business Transactions Act provides a corporation an affirmative defense if it has afforded due attention or exercised proper supervision to prevent the employee from bribing a foreign public official. Spain 2015 Criminal code article 33 exempts corporation from criminal liability if qualifying compliance program in place before employee’s illegal act occurred. Switzerland 2005 Compliance program mitigates if not eliminates corporate criminal liability. Tanzania 2005 Public procurement law requires all bidders to certify they have an anticorruption compliance program and to submit it for review. Thailand 2017 Thai anticorruption agency issues guidelines providing that a company with a compliance program not liable if employee pays bribe. Ukraine 2017 Decision 75 of National Anticorruption Agency requires companies bidding on public contacts exceeding UAH 20 million to have an anticorruption compliance program. United Kingdom 2010 The 2010 Bribery Act provides that a commercial organisation is guilty of an offence if a person associated with it bribes another to obtain or retain either business for the organisation or an advantage in the conduct of its business. It is a defence for the organization to prove it had in place adequate procedures designed to prevent persons associated with it from undertaking such conduct. United States 2004 U.S. Sentencing Guidelines provide a corporation may receive a reduced sentence if it exercises due diligence to prevent criminal conduct, promotes a culture of ethical conduct and has in place a compliance system. Companies implementing public contracts greater than $5 million and requiring more than 120 days must have compliance program (2008). Ireland Government has introduced legislation making a corporation liable for the actions of directors, managers, employees or agents who commit a corruption offence that benefits the corporation. Company can defend by showing it took all reasonable measures and exercised due diligence to avoid the commission of the offence. Vietnam National Assembly debating legislation that would mandate compliance programs for privately-owned corporations. Establish a business ethics awareness and compliance program within 90 days of award that provides training to principals, employees, agents and subcontractors (as appropriate) on the organization’s standards, procedures, and other aspects of the code of ethics and compliance an internal control system. Establish internal control systems that clearly define standards and procedures for the timely disclosure of improper conduct and ensure that those procedures are effectively carried out. Internal controls should also include regular evaluation of the effectiveness of the organization’s code ethics program. The relevant section of the FAR is CFR 52.203-13, See here or here for further discussion. Passing such a requirement into law will not immediately result in improvement. It will take companies some time to understand what it is that they have to do, and for a service industry to spring up in the country that provides guidance and training for companies. This learning period’ could be recognised in law by some sort of delayed implementation period. It can also be accelerated by asking the larger international companies to assist in capacity building in the country, for example with the companies in their supply chains. Example: Republic of Korea. In order to revamp the tainted image of the construction industry, the Ministry of Land, Infrastructure and Transport (MOLIT) of the Republic of Korea introduced a new regulation, the amended Article 9-3 of the Framework Act on the Construction Industry, on 11 August 2015 as Act No. 13469. 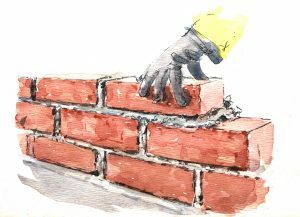 Any newly registered construction company should receive mandatory training on topics such as business ethics, fair competition, the environment, safety, quality management, and technical standards at six construction industry associations nationwide. The revised law further provides incentives for bidders with misconduct cases. Any company under suspension can reduce penalty days if it receives business ethics and technical training. Source: G20 Germany, Business 20 Dialogue, Promoting Integrity by Creating Opportunities for Responsible Business,B20 Cross-Thematic Group, Responsible Business Conduct and Anti-Corruption (2017). The incentives that encourage corrupt commercial behaviour are strong: the temptation to collude with your competitors, the temptation to gain improper influence on those making the contract decisions, the temptation to use the corporation’s money to buy political influence. Companies have come a long way in seeking to behave better in the past two decades, but these temptations will always be present. Through the law: It is difficult to investigate and expensive to prosecute corruption, and white-collar crime in general. So, in practice, many countries de-emphasise such topics. Some countries, such as the Nordic countries, have largely disestablished their white-collar crime units. Monopoly investigations: The classic technique for reducing pressure on profits is to absorb or destroy your competitors. In today’s world, this is as all-pervasive as ever. Public enquiries: Bringing bad practices out into the light of public scrutiny is one of the most powerful ways of changing behaviour and culture. Public enquiries can be a good way to do this. It can become prime time TV and thereby change public norms and values. 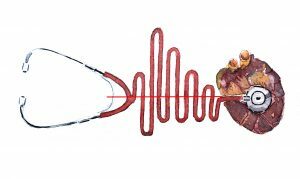 Audits: Evidence is at the heart of reform, and audits should be one of the most useful ways of gathering evidence. Often, though, this is not the case, and audit offices are frequently under-resourced and left out of the influence chain altogether. Control and scrutiny agencies: Similarly, such agencies can be powerful, but often have relapsed into not really doing their job. The objective here is not to start up a batch of investigations. The right action is to review these investigation mechanisms to decide whether they are doing their job effectively or not. Where they are not, then action to improve them should be become one of the priorities of government leadership, and form part of the anti-corruption strategy. In early 2012, Mabey Engineering (Holdings) agreed to pay back £130,000 in recognition of sums it received through share dividends derived from contracts won through unlawful conduct by its subsidiary, Mabey & Johnson. The subsidiary had pleaded guilty to charges of corruption and breaches of UN sanctions and was convicted in September 2009. Richard Alderman, the then-Director of the Serious Fraud Office (SFO), said: “There are two key messages I would like to highlight. First, shareholders who receive the proceeds of crime can expect civil action against them to recover the money. The SFO will pursue this approach vigorously… The second, broader point is that shareholders and investors in companies are obliged to satisfy themselves with the business practices of the companies they invest in… It is particularly so for institutional investors who have the knowledge and expertise to do it. The SFO intends to use the civil recovery process to pursue investors who have benefited from illegal activity. Where the issues arise, we will be much less sympathetic to institutional investors whose due diligence has clearly been lax in this respect “ (Source: Humboldt-Viadrina School of Governance, Motivating Business to Counter Corruption: A Practitioner Handbook on Anti-Corruption Incentives and Sanctions (2013)). The starting point for many governments in tackling corruption is the UN Convention against Corruption (UNCAC). UNCAC contains provisions relating to corporate integrity, and there is a useful UN document A Resource Guide on State Measures for Strengthening Corporate Integrity (2013) which provides guidance to states to meeting the private sector components of the UNCAC. There are additionally sections of the publication focused on compliance measures at the company level. Legal sanctions and incentives represent a range of financial and non-financial measures implemented by means of law-based regulations. Commercial sanctions and incentives represent a range of measures implemented in business relationships. Evaluation: Are the measures working? Evaluation requires a two-pronged approach and should be carried out a regular basis. Firstly, how effectively and efficiently the applied sanctions and incentives are implemented. Secondly, to what extent they contribute to the overarching goal of motivating business to counter corruption. Humboldt-Viadrina also did a survey in 2012 of 223 international anti-corruption experts to rank the incentives and sanctions in terms of their likely impact based on the views of those surveyed. Most – 74% of those surveyed – felt that incentives and sanctions were equally important. There was variation by region: North American respondents rated sanctions as considerably more important than the average than incentives. Respondents from Latin America, Asia the Middle east and Africa rated sanctions as less important than incentives. Suspension and debarment are sanctions imposed by a public entity against businesses and individuals to bar them from participating in public procurements. Typically, systems of suspension and debarment are administrative mechanisms that regulate contractor behaviour, but still at least partially independent of it. The systems can be implemented by a nation for all of its departments and ministries; in the alternative, they can be implemented by a single ministry. This description comes from Transparency International and Covington (2015). They deter these problems in both “specific” and “general” ways. Specific deterrence occurs when a misbehaving contractor is individually stopped and removed from the procurement process, thus barring ongoing or future misconduct by that contractor. General deterrence occurs because of the broader salutary impact that suspension and debarment can have on contractor conduct throughout the industry—in effect, the promotion of a broader culture of business ethics. A culture of business ethics is inculcated in several ways. For one thing, it is in a contractor’s financial interest to remain eligible to receive and perform public contracts; to that end, a suspension and debarment system institutionalizes and ratifies a procurement process that rewards ethical behaviour, not unethical behaviour. A contractor is incentivized to act ethically when a suspension and debarment system ensures that there are significant consequences for specified deviations from certain ethical norms, to include ineligibility for public contracts, and also benefits for complying with such norms. Indeed, to avoid sanction, a contractor must adopt internal compliance systems that are robust enough to prevent, identify, mitigate, and eliminate unethical or illegal behaviour. In turn, a broader, industry-wide culture and climate of ethical conduct and good corporate governance takes root. There are suspension and debarment systems in five different jurisdictions: 1) the United States; 2) the World Bank; 3) Brazil; 4) India; and 5) Kenya. The U.S. system has discretionary elements that allow an appropriate sanction to be tailored to the specific misconduct; this, combined with a focus on present responsibility, allows suspension and debarment in the United States to promote real, utilitarian goals. Meanwhile, the World Bank system incorporates not only a range of sanctions, but also a cross-debarment practice that allows the World Bank to ensure that corruption on one contract, in one jurisdiction, does not transfer to another. Brazil’s stern anti-corruption posture and its recent initiatives under the Brazil Clean Company Act not only punish corruption, but also attempt to promote ethical behaviour. In India, the practice of suspension and debarment by both government ministries and state enterprises reflects to some extent a pan-government experiment in how sanctions can be tailored by different procuring entities in fair, rational, and effective ways. Lastly, Kenya authorizes private citizens to recommend investigations into potential misconduct, thus giving the public itself a direct role in battling corruption. It is no simple matter to implement or administer a suspension and debarment system. There are obstacles that each system must continuously reckon with—e.g., the risk that suspension and debarment will be used to perpetuate corruption, not to combat it, and also the complexity of administering a suspension and debarment system, which can undermine a system’s effectiveness. Yet there are, at the same time, certain “best practices” of suspension and debarment that should have universal appeal. And these best practices are what should appeal to both procuring governments and contractors. After all, neither constituency is well-served by the lack of a well-functioning suspension and debarment system. A suspension and debarment system that models these best practices will have appropriate goals and standards; afford necessary due process to contractors; coordinate on both intra-government and inter-government bases; ensure transparent decision-making and processes; and sanction contractors only as necessary and commensurate with reasonable, fair goals. Governments cannot and should not seek to do everything themselves. This applies as much to incentivising good private sector behaviour as to anything else. In relation to private sector corruption, there is a huge role to be played by the media and by civil society in monitoring what companies are doing. A number of the sources outlined in the previous sections describe the role that civil society can play in boosting anti-corruption measures. 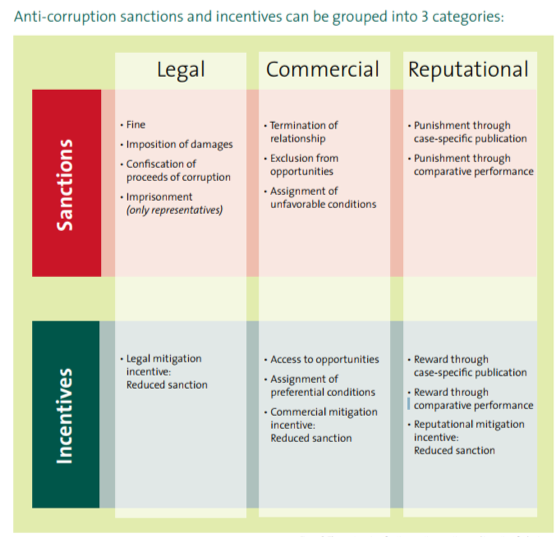 The Humboldt-Vienna School of Governance has a good publication on this entitled Motivating Business to Counter Corruption, A Practitioner Handbook on Anti-Corruption Incentives and Sanctions (2013). As they put it: ‘Besides applying reputational measures, civil society can do much to motivate in business to counter corruption. Civil society organizations can for example advocate for and monitor the application of legal and commercial sanctions and incentives by the public and business sectors’. They also make the point that civil society can directly assist the business sector in making the case for such efforts: ‘Advocates, opinion leaders, journalists, and other civil society stakeholders can have significant influence on public opinion and can thus strengthen the business case to counter corruption by applying mostly reputational measures. Making corruption cases public or assessing reporting of companies in a ranking can be very powerful measures to motivate business’. In some national environments, civil society is already vibrant and active. This is not confined to developed country environments: civil societies can be more active and more influential in developing country environments, such as in Mexico, Philippines or Indonesia. Whether currently active or not, often governments can strengthen the influence of civil society by encouraging them onto government bodies, government agencies, Inquiries and Commissions, and so forth. Inviting both business bodies and civil society organisations into policy making and policy advice brings them together and builds knowledge and trust across what can be a traditionally hostile relationship. There can be many hundreds of such joint working environments. The next part is to think through and develop an overall strategy. If ever there was a contest for the most over-used word in language, ‘strategy’ would be on the short list. The word came originally from the Greek word for leadership in a military context: how to conceive and craft a successful strategy against your enemy. It means, in brief, picking the right battles, ignoring lesser objectives and about simplicity: strong determination in carrying through a simple idea is seen as the route to success. However, since the idea of strategy entered the civilian world in the 1970s, it has become more sanitised. It tends now to mean the overall programme of activities to achieve a formal objective and may consist of little more than a wish-list of measures, without consideration of how to achieve them or how to overcome resistance. This is a pity, because the essence of the original meaning – how to achieve something that will be resisted – is important. The sections above provide many ideas for how to encourage or incentivise or push the private sector into active collaboration with the government in reducing corruption. Many of the ideas can also be incorporated into government anti-corruption strategies without modification or further considerations of strategy. Maximising supportive structures across government & stakeholders. You can read more guidance on Step 3 here. Multilateral organisations associated with the sector (e.g. World Health Organisation). They too may have anti-corruption knowledge and capability. OECD has a large group focused on public integrity and anti-corruption. There are multiple stand-alone initiatives focused on issues such as beneficial ownership transparency, or access to information. Multilateral development organisations, like the World Bank, UNDP and U4, can hold valuable sector knowledge and expertise, whether or not you are based in a developing country. There are now several initiatives supporting improved anti-corruption behaviour by companies, notably the B20 (the business equivalent of the G20), the OECD, the World Economic Fortum and PACI. OECD has been energetic in devising collaborations between governments and businesses to reduce the impact of corruption. They have several fora and working groups dedicated to this objective. They also address wider issues where corporate activity and corruption overlap, notably on lobbying. For governments and companies who wish to address the improper exercise of corporate influence on public policy material published by the OECD on regulation of lobbying could be a ready starting point of access to the subject. The OECD’s 10 Principles for Transparency and Integrity in Lobbying (see 2013 for a summary) are a common reference point and cover four main areas: Building an effective and fair framework for openness and access, Enhancing transparency, Fostering a culture of integrity and Mechanisms for effective implementation, compliance and review. The OECD 2014 publication, Lobbyists, governments and public trust, is focused on implementation of these standards and includes country case studies from Austria, Brazil, Canada, Chile, Hungary, Ireland, Italy, Mexico, Slovenia and the UK. It recommends that countries focus efforts on implementation of the Recommendation in Principles for Transparency and Integrity in Lobbying ; Identify relevant data, benchmarks and indicators relative to transparency in lobbying, the public decision-making process and, ultimately, the broader integrity framework in order to measure costs, identify benefits and monitor performance; Strengthen the implementation of the wider integrity framework, as it is the prime tool for safeguarding transparency and integrity in the decision-making in general and lobbying practices in particular; and Review policies for managing conflict of interest to ensure that revolving door practices and the unbalanced representation and influence of advisory groups are effectively mitigated. Regional Initiatives – High-level business-government-civil society meetings are held across emerging and high-growth markets on the key drivers of corruption and emerging trends that support the fight against corruption. In 2014, strategic dialogues on anti-corruption were held in the Philippines and Nigeria; and at a special session at the India Economic Summit linked to the PACI Vanguard agenda. Industry Projects – Collective Action in the Infrastructure and Real Estate Industries: An in-depth review of corruption and transparency challenges in the infrastructure and real estate industries through a dialogue series and supporting risk analysis. The objective of this multi-year collaborative project (currently Building Foundations for Transparency) is to achieve CEO-level commitment to a mutually developed framework for collective action on sector-specific priorities. Global Agenda Council on Transparency & Anti-Corruption. 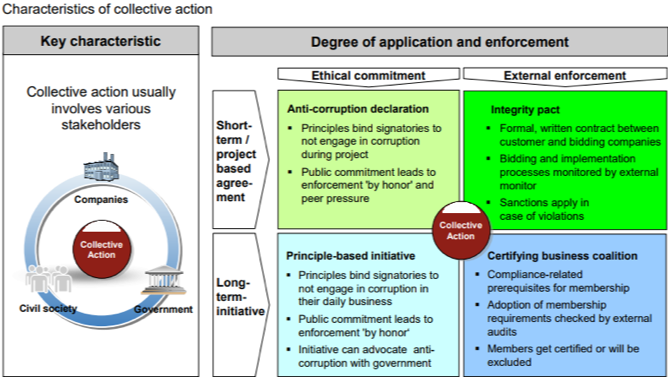 In the 2014-2016 term, the Global Agenda Council on Transparency & Anti-Corruption will support large-scale transformation by identifying and advancing the core levers of change, such as B20 collective action hubs, and harmonizing legal framework to design corruption out of the system at global, regional and industry levels. B20 Task Force on Anti-Corruption. This year the B20 Turkey continued to focus on priority areas pursued under the Australian presidency of 2014 to reflect the Turkish G20 presidency’s focus on boosting economic growth and creating jobs. Anti-corruption is one of those priority areas and the Turkish B20 presidency decided to dedicate a separate task force for anti-corruption. The Anti-Corruption Task Force (ACTF) has more than 70 members who are mostly senior executives from business, business associations and professional services firms. 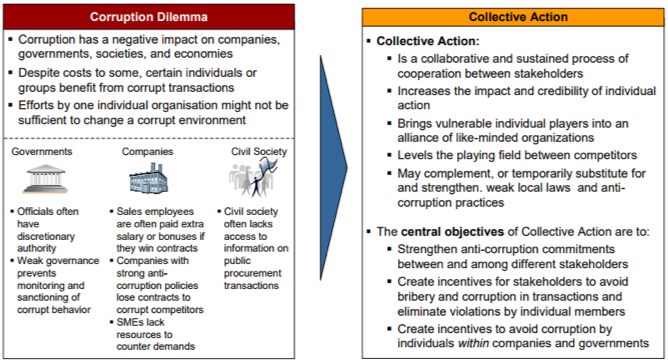 The World Bank (2008) has a useful document called Fighting corruption through collective action: a guide for business. They define Collective Action as ‘a collaborative and sustained process of cooperation between stakeholders. It increases the impact and credibility of individual action, brings vulnerable individual players into an alliance of like-minded organizations and levels the playing field between competitors. Collective Action can complement or temporarily substitute for and strengthen weak local laws and anti-corruption practices’ (p.4). Collective Action at the sectoral or project level has been readily taken up in anti-corruption initiatives originating from within the private sector as well as initiatives instigated by government or civil society. As a group which may theoretically share common interests in a level playing field free of corruption, Collective Action has been seen as a means of framing private sector engagement in anti-corruption in terms of mutual self-interest. It is further regarded as a means of encouraging collaboration between the private sector, government and civil society. 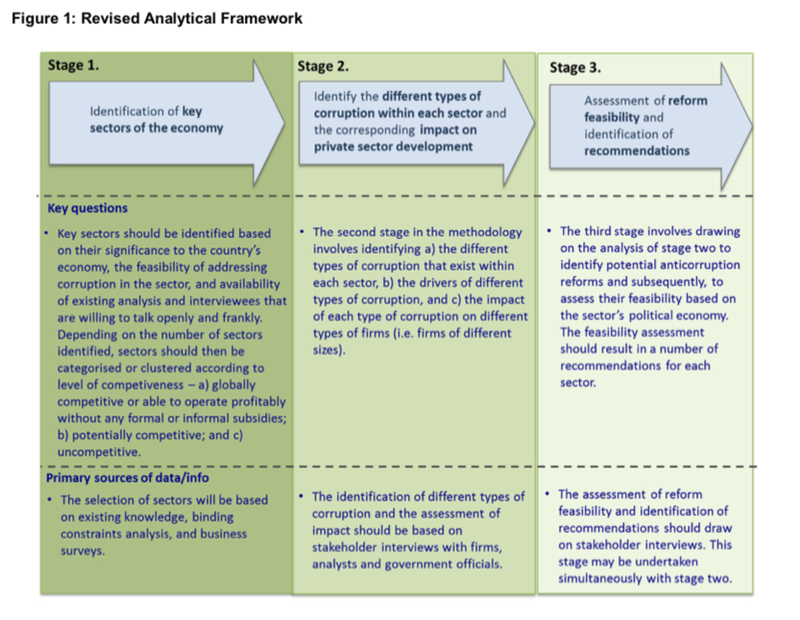 The diagrams below illustrate collective action as seen by the World Bank. The report gives examples from Brazil, Mexico, Paraguay, Philippines and elsewhere. World Bank guidance on collaborative action. How to strengthen the private sector and reduce corruption in conflict environments is a whole topic in itself. It has been given a lot of attention in the last 15 years from the wars in Afghanistan and Iraq. In addition, there has been valuable experience from other conflict environments such as Liberia and Timor-Leste. Contracting should not go to the wrong people and empower local powerbrokers. Instead stable networks with local businesses should be established. Contracting with vendors who use fewer subcontractors is beneficial in terms of accountability. There should be substantial planning before the contract award since haste leads to waste and fraud. Contracts should not be awarding according to the price solely. Instead the contract should take forward the mission’s objectives. Post-award oversight of contractors is equally as important. According to NATO estimations, the proportion of local contracting in Iraq and Afghanistan was negligible compared to international contracting: up to 5-10% of total expeditionary contracting. Nonetheless, a great deal of knowledge was collected on how foreign assistance forces could build up local contractors. Successful international and local contracting in reconstruction and procurement was part of the strategy to win hearts and minds. 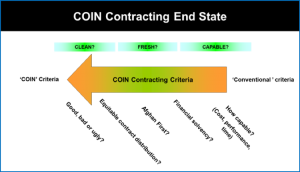 Requirements for wartime contracting had to be sustained to a level high enough to ensure that the contractor is “capable” (does what he says he will do, performs well), “fresh” (a thriving supplier’ base, subjected to wide competition) and “clean” (not corrupted and not part of the Corrupt Patronage Networks). In terms of local contractors, some of Afghan companies had remarkable performance rate and good ethic and accountability compliance (“good”). The majority of firms, however, are either poor performers (“bad”) or linked to local criminal patronage networks (“ugly”). While in the theatre contracting with the “bad” is often good enough, doing business with the “ugly” is harmful and risky in terms of successful counter-insurgency. Sometimes, however, the “ugly” seems to be the only viable option for a contract award. 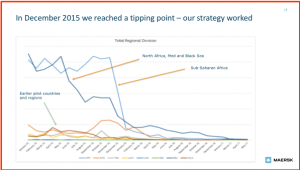 Expeditionary contracting as a strategy spreads across five main levels. Philosophy – At the top level, it’s the uppermost philosophy or the doctrine of wartime contracting focusing on its essence and role in the counter-contingency operations, such as to what extend should it be utilized, should priority be given to contractors or rather to developing in-house expertise, etc. Policy – The specific policies should be guided by the consolidated doctrine at the top level. Thus, at the level of various policies (e.g. trucking, supply chain, etc) expeditionary contracting should be monitored and thought through the prism of the anti-corruption strategy once again. Applicable in this case would be a strategic in its essence but practical in its implication guidance, such as COIN Contracting Guideline. Commanders – This is the level where the most robust education and training approach should be addressed to, in terms of a doctrine, training and mind-set. The commanders’ level is also the inter-connection between the strategic philosophy of wartime contracting and its day-to-day tactical implementation and enforcement in the theatre. Good practices at this level have been observed through TF Shafafiyat, for example. Contracting officers – this is the level of actual implementation of the principles of expeditionary contracting and that’s why shift in the mind-set of contracting officers and their training and education is essential. Guidance – At the bottom level, robust rules and procedures should be established so day-to-day contracting in conflict areas could be subjected to benchmarking. Buying and contracting locally is beneficiary for the sustainable peace and economy of the target country in terms of creating jobs, increasing local businesses access to capital and generating re-spending locally on purchases from other local businesses and thus multiplying the effect of donor aid and efforts. Since its launch in 2006, the Sustainable Market Initiative in Afghanistan has resulted in the facilitation of 1,400 contracts redirecting over $1.1 billion into the Afghan economy. 118,000 jobs were created or sustained and 8,300 local businesses including 272 local female-owned businesses have been registered at PDT’s database. Additionally, 1,556 entrepreneurs have received procurement and tendering training which should provide for their ability to compete and carry out larger international contracts. See, for example, Transparency International Defence and Security (2012) Overview of political economy, contracting and corruption in Afghanistan, the case of Kandahar. In Haiti since 2009, the NGO Building Markets has facilitated 1,531 local contracts and redirected more than $38 million into the Haitian economy, included 3,800 Haitian businesses, including 930 that are female-owned in their online database, 1,000 local entrepreneurs have received training. Additionally, their Tender Distribution Services have collected and disseminated more than 1,000 tenders to local businesses, creating transparency in contracting and increasing access to new business opportunities. In Liberia, even though the majority of businesses are extremely small (58% employing less than five people), the international community involvement has had a positive impact- according to Building Markets on average 71 cents of every dollar spent on local procurement will be re-spent within the Liberian economy. Women manage 30% of SMEs which is well above the average for sub-Saharan Africa (15%) and the world as a whole (19%). Additionally, while only a small proportion of businesses have submitted bids in the last six months, those that did bid had a 75% success rate in winning at least one contract. In the period of 2007- 2011 when NGO the Building Markets was operational there, the project has had a significant impact on the development of local capacity. Over 13,000 local transactions have been facilitated and more than $20 million have been redirected into the Timorese economy. The project team have registered and verified more than 3,000 Timorese businesses, including 952 that were female-owned. Furthermore, the initiative in Timor-Leste has included micro-matchmaking, a unique innovation in Timor-Leste. This service has worked in nine districts to facilitate thousands of smaller transactions in the poorest and most isolated parts of the country and has helped re-establish business relationships with Indonesia, Timor-Leste’s largest trading partner. Contacting others really helps because corruption is a tough problem, with no ‘manual’ of how to go about tackling it.It is not just a ‘nice thing’ to do. We find that others working in their sector round the world – whether it be a very public sector like health or a more private sector one like telecommunications – are open to being contacted and happy to respond. People everywhere really hate corruption, and this is why you’ll find lots of support for your reform ideas. Professionals in each sector know that much of the corruption reform available guidance is generic, in reports or in the form of technical advice from institutions. They’ll be happy to get down to sector level actions, where the real impact of corruption issues is usually seen. Get in touch with the people at the transnational organisations outlined in Section 4 of each of the sector reviews. Ask them for their help and input. Ask other readers and followers of CurbingCorruption: Use the Twitter and Linkedin buttons below or on the top of the home page. Contact the authors of any of the articles and references that we cite. Our experience is that they are happy to respond to questions. Contacting others also has a second benefit. Most of us who are involved in efforts against corruption, whatever their country or sector, are nervous of whether our anti-corruption ideas are plausible. Officials are aware they have no deep knowledge of how to tackle corruption and have less time to spend on this than they would like; so they are lacking in confidence. The best way to gain confidence is to talk with other people who also understand the problems in your sector. Khan, Mushtaq (2014) Corruption and Private Sector Development: Bangladesh Case Study (2014). The public sector has been the predominant focus of anti-corruption reforms promoted by international development agencies. In analysis of business-orientated definitions of corruption, Hough (2017) explains that traditional economic analysis of corruption saw business as ‘responding to the incentives placed before it by more or less corrupt officials’, with the implication that corruption analysis should start with the state. Hough considers that increased interest in the private sector has come about for two reasons: first, recognition that businesses can take a ‘proactive role’ in shaping potentially corrupt transactions, and second, the ‘privatisation of public policy’ has meant that corrupt activity seemingly only involving the private sector can have significant implications for the public. The result is that business behaviour needs to be seen as an ‘important part of the corruption mosaic’. That reforms have not historically focused on the private sector is reflected in the relatively low level of attention on this issue in the anti-corruption literature. This is notwithstanding that there is high volume of material which has emanated principally from the private sector on compliance and anti-corruption standards within the firm. As businesses respond to stronger domestic and international legal regimes on anti-corruption as well as increased emphasis on corporate social responsibility, a large body of literature has developed on best practices in corporate anti-corruption programmes. Public guidance is readily available for businesses on internal measures to control corruption and this review provides some starting material if this is your area of interest (See 14.2 above for several examples). Building on this, there are also a growing number of initiatives often led from the private sector on coordinating business behaviour and anti-corruption advocacy between firms and other stakeholders. This is known as collective action and this review similarly includes examples of such initiatives from the substantial public material available (See Chapter 6 above). Nevertheless, the primary weakness in the literature is that work on corporate compliance and behaviour has arguably largely proceeded as a distinct area separate from wider ranging public-sector reforms. On the evidence of the available literature, it is only recently that practitioners have begun to tackle the question of how to integrate the private sector into wider country and sectoral anti-corruption programmes. The good news is that this work has started, and the review cites some useful reports from organisations such as the Center for International Private Enterprise, the Humboldt-Viadrina School of Governance and the United Nations Convention against Corruption, which are valuable starting points for all readers interested in this topic. Furthermore, this is as a growing area of research. In 2016 the Department for International Development (DFID) in the UK commissioned a five-year programme of research, the Anti-Corruption Evidence (ACE) programme, led by the School of Oriental and African Studies (SOAS), which has the private sector as a major area of focus. Background on the programme is available on the SOAS ACE website. A weakness in the literature and in many of the examples provided is that there are no substantive reviews which assess the effectiveness of the reforms proposed. There is a tendency for reform recommendations to be described in general terms without being supported by evaluative studies on how the measures have played out in different institutional and political contexts. And, although there is common acknowledgement of the varying effects of corruption on, for example, Small and Medium Sized Enterprises (SMEs), we have not seen detailed analysis or truly differentiated approaches on how different types of business can be engaged in anti-corruption reforms. Corruption can have a fundamentally different impact on a business dependent on its size, sector and nature of activity, which should be clearly factored into policy responses. 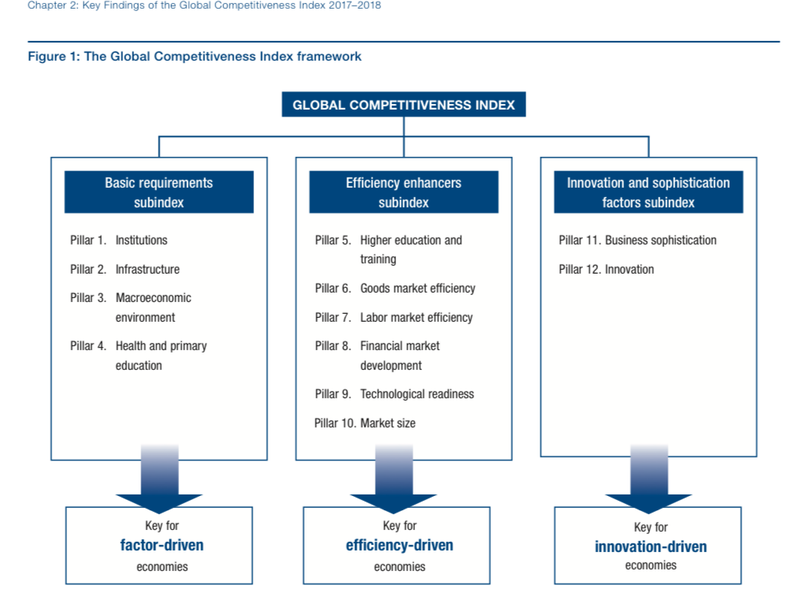 World Economic Forum (2018) The Global Competitiveness Report 2017–2018, Klaus Schwab, World Economic Forum.